Ricky and Ronnie Schilling packed everything they owned into a beat-up Lincoln and headed south for Tunica, Mississippi in early 1992. People called them idiots. The two brothers had a checkered history in the entertainment business. They owned a string of floating nightclub barges docked on the banks of the Ohio River in Cincinnati. With names like Porky’s, Prime Time, and The Beat Club, they made the most of the fading disco era. The last of their floating discos was Splash. They packed up the failed party barge and sent it down the Ohio River where it connected with the Mississippi River and finally docked in Tunica. The Schillings planned to repurpose the barge as Splash Casino. People who heard their plan thought they were crazy. Tunica was one of the poorest counties in the U.S. It had 8,100 residents in 1990, down 64% from the 1940 census. In the winter, unemployment peaked at 27%. Tunica was a dead end. The Schillings learned that the Mississippi legislature, desperate for revenue, passed a law in the summer of 1990 legalizing riverboat gambling. The law, House Bill No. 2, created a gaming commission which laid out conditions for licensed riverboat gaming operations. A state senator from southern Mississippi initially proposed the bill as a long shot to help his desperate county. Tunica and others joined in. The chairman of the legislative committee later said of the bill, “Nobody took it seriously.” The Schillings did… and they made a fortune. The former disco barge turned casino opened for business on October 19, 1992. The brothers charged a $10 cover to board the boat filled with slots and table games. The Schillings cleared $25 million in gaming revenue during their first five weeks operating the casino barge. It was more cash than they could physically count even with the help of machines. What’s more, the struggling town’s budget grew 10-fold to nearly $30 million within four years of the first casino opening. Property taxes went to zero as new casinos financed the city’s road and utility infrastructure growth. The newly organized Mississippi Gaming Commission applied a 12% tax on casino profits. 8% went to the state and 4% to the county. Within four years, the state took in upwards of $250 million per year in gaming taxes. That number would nearly double in the following decade as gaming revenue neared $3 billion. Mississippi became the biggest gambling destination outside of Las Vegas and Atlantic City. Tunica went from being a dead end to having its own private airport for casino-owned jets ferrying in high rollers. The town had 17 motel rooms before the Schillings came to town… Within four years, it had 6,000. While Tunica is a multibillion-dollar casino town today, the Schillings were first. They made millions overnight before there was any competition. People lined up to pay Ricky and Ronnie Schilling a $10 entry fee in 1992 because they had nowhere else to legally gamble. The brothers raked in a fortune so large they turned it into their own personal entertainment empire. When a new industry opens up, the first-movers make more money than the dozens of companies that rush in to compete during the years that follow. That’s because in the beginning, there is no competition. The Schillings had the Tunica gambling market cornered for about a year. Then Harrah’s opened down the road. The big-name casino companies came to town paying any price to get a foothold in the market. The race was on and the early days of easy money were over. I’m telling you this story because this is what we’re seeing today in the sports betting industry. And like the Schillings, we have a chance to strike it rich by betting on the first-movers in this burgeoning industry. Today, 24 states have licensed commercial casinos in operation within their borders. Add in another 508 tribal casinos and there’s no shortage of places to play slots and traditional table games. However, legally betting on sports is an entirely new industry. The Supreme Court’s landmark ruling in May created a new, billion-dollar industry overnight. Last year, sports fans bet an estimated $10 billion on the NCAA Final Four. They bet upwards of $5 billion on the Super Bowl. Add in 16 regular season NFL games, a full MLB season, hockey, and prop bets on everything you can imagine… and the total amount wagered on sports was well in excess of $100 billion. In September, we flew to New York to watch the Miami Dolphins take on the New York Jets. The Jets play at MetLife Stadium in the Meadowlands Sports Complex in East Rutherford, New Jersey where sports betting is now legal. We arrived at the game two hours early to make sure we had time to place our bets. The horse track next to MetLife Stadium has a betting window. It leased half of it out to the sports betting company FanDuel. 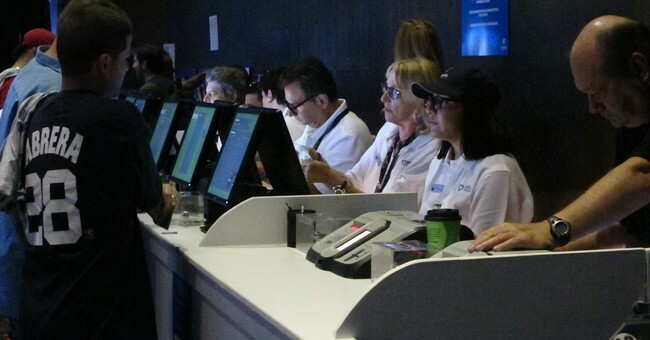 FanDuel had luxury buses shuttling sports bettors from the stadium to the horse track. It wanted to make it as easy as possible for people attending the game to place legal bets. However, several people we talked to had no idea legal betting was available on site. The ones who did couldn’t believe how easy it was. Five minutes later, the bus dropped us off at the sportsbook. The betting area had dozens of TVs showing pre-game shows. FanDuel even has its own commentators talking up that day’s games. Even the clerk who took my money looked surprised at my unpopular bets. What makes sports betting so lucrative is people’s tendency to bet on the favored teams. The other bettors on the bus back to the game proudly rattled off their bets on the most popular teams. I do the exact opposite. Placing five equal bets spreads my risk. I put $500 on the games and got $535 back. In fairness, had the heavy underdog Cleveland Browns held on in the final minutes of their game, I would have had another $635 coming my way. Placing bets at the new FanDuel sportsbook was easy. It took minutes. There are no bookies to deal with and no headaches. Withdrawing money is just as easy. By striking down a federal law prohibiting sports betting, the Supreme Court opened the floodgates to a multibillion-dollar industry. As sports betting comes out of the shadows and into the mainstream, we see a huge profit opportunity. Thanks to the May Supreme Court ruling I mentioned above, $4 billion is set to move into three well-positioned stocks in one day. I just released a brand-new video with all the details, which you can view right here.